Why Is It So Hard For Sensing And Intuitive Types To Understand One Another? I’ve been informally studying the Myers-Briggs® typology system for about 10 years now, but for most of that time I still felt confused about the difference between Sensing and Intuition. Though I’m usually pretty good at seeing things from other people’s perspectives as an INFJ, I’d have a hard time understanding Sensors. 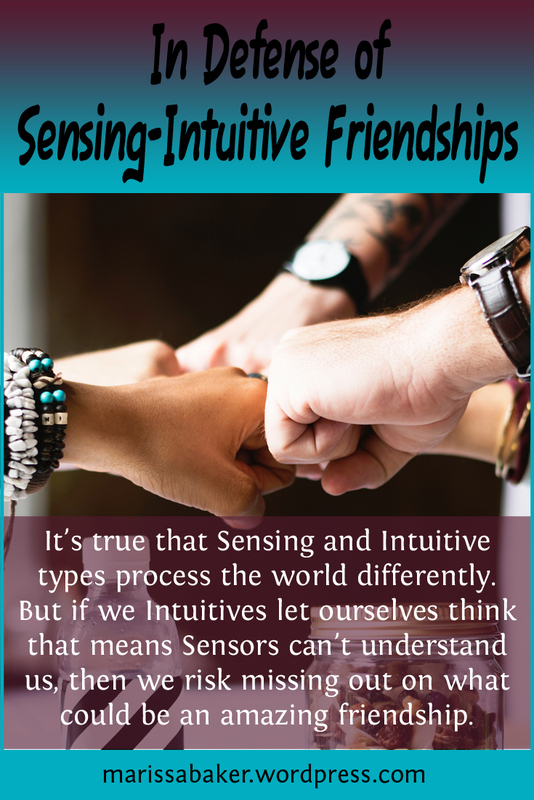 I had good friendships with Sensing types, and I’d protest when people in the Intuitive community spread hurtful myths about Sensors, but I got stuck explaining the exact difference between the two. I think this is a problem that quite a few of us face. For myself and many others who I’ve talked with online, the Sensing/Intuitive dynamic is even harder to figure out than Introvert/Extrovert, Thinking/Feeling, or Judging/Perceiving. Someone who doesn’t share our S/N preference seems even less “like us” than those who don’t match on the E/I, T/F, or J/P. Our preference for Sensing or Intuition influences us, and how we relate to others, so much that most typologists say you should only date or marry someone who matches your S/N preference. People like sorting themselves into groups with other people. We identify with those who share our political views, have similar religious traditions, look like us, went to the same schools, etc. This seems to be a normal human thing. But it’s an all-too-easy shift to go from thinking “I am like these people” to thinking “I am not like those other people.” Now we have an “us” group and a “them” group. And the slide into deciding that “we” are better than “them” is one that has lead to all sorts of trouble throughout human history. Tackling all the “us” vs “them” issues in the world today is far too large a scope for a single post. But I do want to address how this mindset is affecting communities interested in personality types. If there was ever a group that should be able to avoid turning against people unlike themselves it should be those learning about personalities. Sadly, that’s not always the case. One of the core ideas in personality type systems like Myers-Briggs and the Enneagram is that no one type is better than any other type. Every type has strengths and weaknesses and every type is equally valuable. That’s a central part of these personality systems. They’re designed to help you understand your type and other people’s types so that you can better appreciate the variety inherent to humanity. But even though personality types are meant to help us better appreciate other people the opposite happens far too often. Introverts accuse extroverts of ruining the world and hating us. Intuitives spread hurtful myths about Sensing types. INFJs portray themselves (or are described by others) as otherworldly, quasi-mythical creatures. And the list goes on and on. I’m an INFJ so I’m going to pick on my own type for a while. I’ve seen topics brought up in INFJ-only settings about how it’s completely unnatural (well-nigh impossible) for an INFJ to be racist or sexist or anything like that. We’re so much better than all those other types that so easily fall prey to attacking other groups of people. Oh, no. We’re so much better than those uncouth bumpkin personality types. What precious little snowflake hypocrites we are. I’m sure you can see the problem here. And using one’s own type as an excuse to turn against other groups of people isn’t confined to INFJs. People of any type can make sweeping generalizations about extroverts, or thinkers, or SP types, or any other combination of letters. And those generalizations are often both inaccurate and unkind. So lets get back to using personality type systems the way they were intended. As a tool to better understand both ourselves and other people, and then to better appreciate them as well. Those of us within the type development community have the tools we need to move past thinking about groups of people with an “us versus them” mindset. We can use type to climb inside other people’s perspectives and learn to appreciate that just because someone processes information and makes decisions differently than us doesn’t mean they’re our enemies or our inferiors. One of the most disturbing trends I’ve noticed in the community of Myers-Briggs enthusiasts is a bias against Sensing types. You’ll see it in comments from Intuitives about how they don’t want any Sensing friends because they couldn’t possibly understand us. It’s someone saying a fictional character is too dumb and shallow to be an INFJ so they have to be ISFJ (or insisting another character has to be INFJ because they’re relatable and imaginative). It’s assuming all SP types are dumb jocks who’d run off a cliff just for a thrill and all SJ types are conservative traditionalists who’d rather die than see the status quo change. There was a similar issue when introverts finally started realizing they weren’t broken extroverts. In some cases, the introvert hype turned into an idea that introverts are better than extroverts, which is simply not true. It resulted in stereotypes being used to tear-down extroverts and build-up introverts. We’re still undoing that damage, but I think we’ve finally started to balance out and realize that introverts and extroverts are equally valuable. No wonder so many people mistype themselves as an INxx — we’re the types flooding the internet with articles about what we’re like and inviting people to identify with us. That’s great for people with those types, but it’s actually one of the things contributing to the anti-sensor bias. I talk with quite a few people who have Intuitive type personalities and grew up feeling misunderstood. They knew they were different from other people but didn’t know why and that led to feelings of loneliness and isolation. In some cases this feeling came from a lack of people they could truly connect with. But others encountered outright rejection or bullying. As we grew up and started learning about our personality types, the feeling of being different started to make sense. Intuitive types do see the world differently from most other people — we only make up 30% of the world’s population. The other 70% of people are Sensing types. And becasue the Intuitive/Sensing side of our personalities describes how we perceive things and learn new information, it plays a huge role in how we frame our conceptions of the world. It’s no wonder that Intuitives feel different from the majority of the people they meet. There’s something incredible about learning you’re not alone. That there really are other people out there who process the world in much the same way you do. People whose eyes won’t glaze over when you dive deep into theoretical discussions, who won’t panic when you suggest a new perspective on traditional ideas, and who think talking about the future framed in all of human history is a great way to spend their afternoons. I think Intuitives need other Intuitives around. I grew up with Intuitive siblings, eventually made several Intuitive friends, and now have the Intuitive Awakening group on Facebook. For close relationships, matching on your Intuition/Sensing preference is going to make it much easier to identify with and understand the other person. And I’m pretty sure any Intuitive with Intuitive friends or family is nodding their heads while reading this. We crave the opportunity to connect with other people who will understand us and validate our way of processing the world. It’s part of being human. It’s no secret I’m a big fan of Myers-Briggs. I’ll defend it against people who say it’s useless, write and re-write posts trying to come up with the simplest introduction to function stacks ever, and spend my time musing about how type influences both real people and fictional characters. But as much as I like the Myers-Briggs system of personality types, I also know there are things it’s not meant to do. 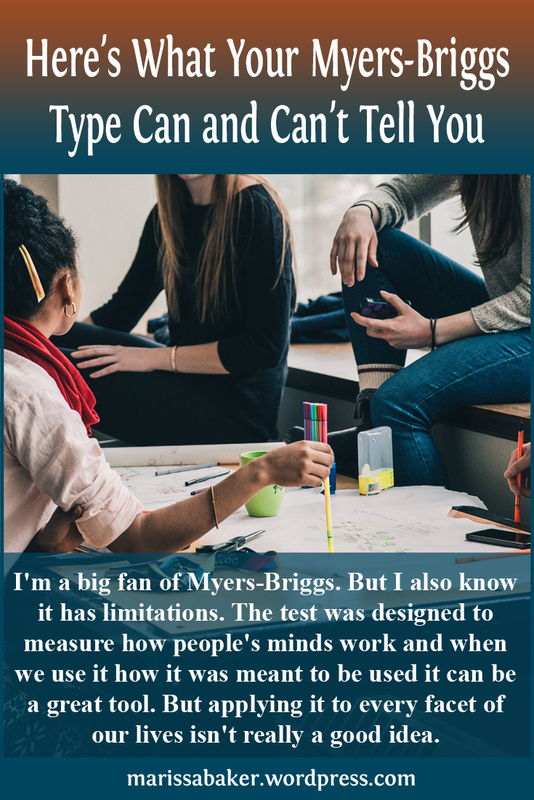 In fact, applying Myers-Briggs wrongly is one of the biggest reasons it has come under so much criticism. For example, you can find quite a few articles online that argue Myers-Briggs is basically useless in a work environment. They’ll tell you it’s not a good indicator of job performance nor is it all that useful for screening potential employees. But that shouldn’t come as a surprise, considering those aren’t the test’s purpose. And it’s unfair to dismiss a test for not doing something it wasn’t meant to do in the first place. So what is the Myers-Briggs test supposed to tell you? And just how much can we apply what we learn from finding our type to real life? The Myers-Briggs test is designed to measure how people’s minds work. It describes their preferred mental processes or “cognitive functions” (to use the technical term). Contrary to what so many critics of the test think, it doesn’t force people into dichotomies. Rather, each type has a “stack” of preferred functions. So an ENFJ type isn’t someone who’s 100% extroverted, intuitive, feeling, and judging. They’re a type that prefers making decisions with Extroverted Feeling, learning new things with Introverted Intuition, and then also uses Extroverted Sensing and Introverted Thinking to a lesser extent (click here to learn how we get from the four letter type to the functions). There’s something magical about meeting a person who “gets” you. It’s like your minds work on the same wavelength and you’re instantly talking as if you’re old friends. The two of you think so much alike that there’s no struggle to explain yourself. This sort of connection often has to do with personality type. Our Myers-Briggs types describe the way our minds work (click here for tips on finding your true Myers-Briggs type). When we meet someone else whose brain processes the word in a similar way, we’re likely to experience a connection with them, especially if we have overlapping interests. In contrast, when we seem to clash with someone for no reason it often has to do with differences in how we process the world. To use a fictional example from the Marvel Cinematic Universe, Steve Rogers and Tony Stark don’t just conflict ideologically. Their ISFJ and ENTP types are exact opposites, which means the mental process Steve is most comfortable using is the one Tony finds most stressful (and vice versa). Many of us seek to surround ourselves with people who think like us. They’re the people we’re most comfortable with, the ones who identify with us, the ones with similar priorities and goals. 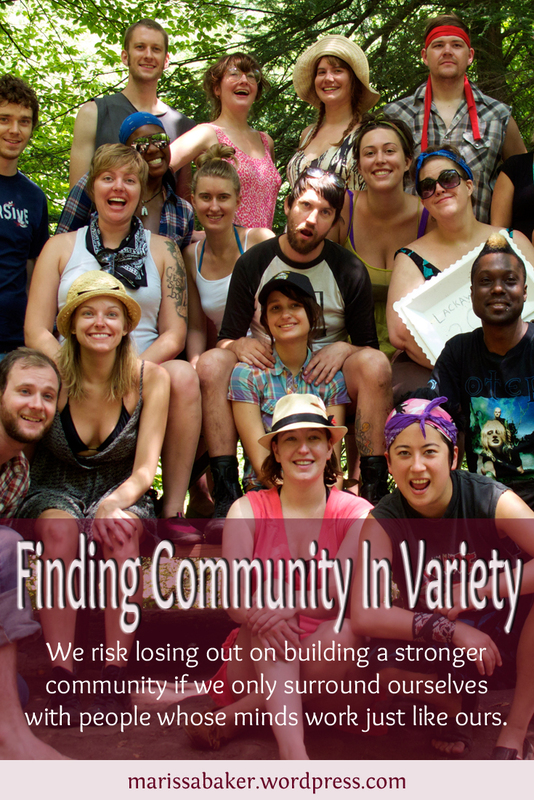 Often this type of community is based around interests, such as spending time with people in your church, joining a bird watching club, or hanging out with friends at a ballgame. 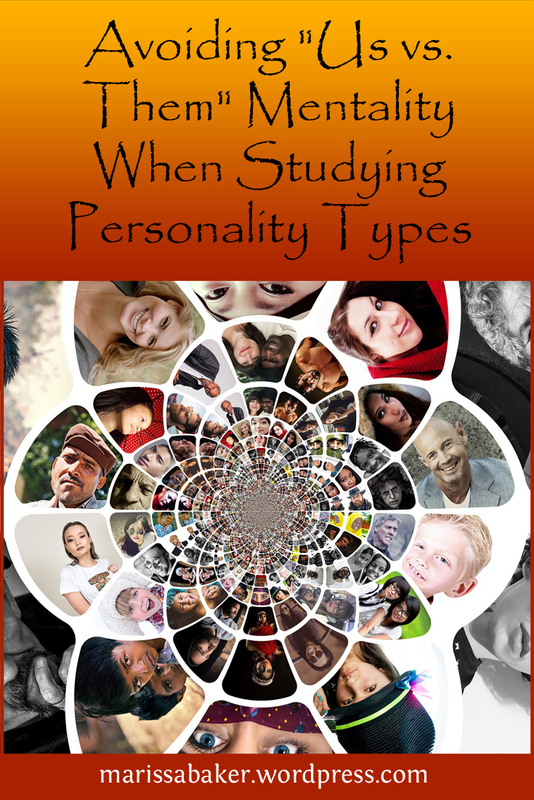 Personality similarities in these groups are typically accidental.